You are sailing on a magic carpet about one thousand feet above the Missouri River. Once a great barrier crossed only by a ferry, the river at Omaha is now spanned by three bridges. Two of them can be seen below you. In the foreground is the Union Pacific trestle. Upstream to the right is the Ak-Sar-Ben Bridge. You are looking northwest toward downtown Omaha. The large territory near the river is the great industrial section. It is flanked by rail facilities. The long, low, white buildings in front of four black smokestacks are part of the Omaha Public Power District plant. 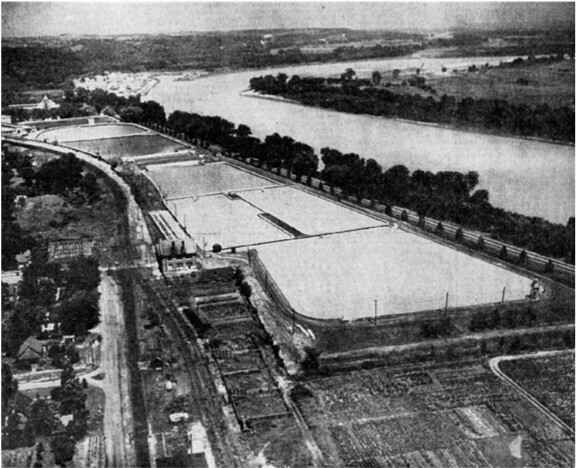 To their immediate right is the Omaha Alcohol Plant. Farther upstream is the plant of the Western Smelting and Refining Company. You are entering Omaha - Gateway to the West! Camera enthusiasts will be interested in the technical data. World-Herald Photographer John S. Savage used a K-1 (light yellow) filter. Lens aperture was f5.6 and shutter speed was one four-hundredths of a second. In This Panorama Are Many Familiar Sites - Can You Find Them? From high over the Missouri River, the camera is looking northwest over downtown Omaha. In the immediate foreground are rail and freight facilities and the big industrial section. In the center of the photo are the tall buildings and the general arrangement of the business district. Seated on your magic carpet, about a thousand feet in the air, you are looking at our town. You are familiar with its streets, it buildings and their relationship to each other, from ground level. Now see if you can locate them from the air. Some that will be at once familiar to you are the WOW building, the structures which house the Union Pacific Headquarters, the Northwestern Bell Telephone Company, and the several big hotels. Others are the Joslyn Memorial, First National Bank Building, and the Medical Arts Building. Can you find the City Auditorium? The spires of St. Cecilia's Cathedral? The Union Station? Looking north from your magic carpet, you are surveying the site of the Port of Omaha. It is at the foot of Davenport Street, north of the Ak-Sar-Ben Bridge. 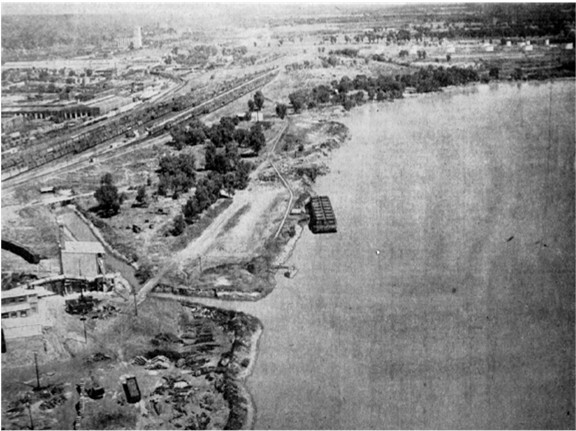 Actually, there isn't much here now - a place for barges to tie up and a spur railroad line. But the promises for the future are great: Modern storage buildings, a giant crane for unloading, and slightly to the west the proposed route of the new multi-million-dollar Limited Access Highway that will enter the city at the north and leave from the southwest. Originally, the plan was to set up temporary dock facilities. Now, says City Planning Engineer J. M. Garrison, the new harbor line will be only 10 feet farther out in the Missouri River instead of more than a hundred. This means the Omaha Dock Board can begin immediately to build permanent buildings under the City-Wide Plan. At the southern fringe of the dock site can be seen the Grace Street sewer outlet. To the west the camera catches the rail yards and part of Omaha's industry. 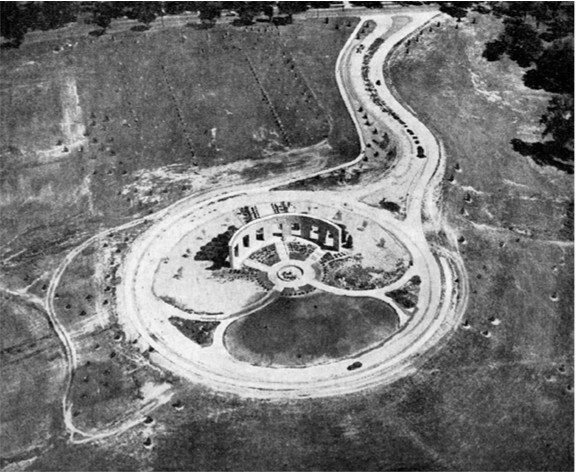 Still in the skeletal stage and its broad greenery scarred from the landscaping work, Memorial Park nevertheless presents a scene of beauty from the air. This Magic Carpet picture gives a foretaste of what is to come when, with its trees in maturity and its design completed, Memorial Park stands as a living memorial to Omaha's war dead. The picture shows the shrine, with the curving approach from Underwood Avenue. The niches for carved stone war scenes, now being made, are discernible in the colonnade. In the center is the pool with fountain. At right of the shrine, its boundary marked by a pathway, is the hollowed-out site of the amphitheater. Above the shrine, outlined by rows of evergreens, is what is to be the rose garden. A sunken rock garden, not shown in the picture, will be located toward the lower right at the intersection of Happy Hollow Boulevard and Dodge Street. The magic carpet is taking you over the Minne Lusa pumping station in Florence. This is the source of your municipal water supply, operated by the Metropolitan Utilities District. Here are the intakes and the great pumps that draw water from the Missouri River (at right). Here are the chlorination plant, the huge sedimentation and storage basins, and the filter plant that has a daily capacity of 72 million gallons. Muddy river water is filtered and treated by scientific methods to supply Omaha with an average of more than 28 million gallons of pure water each day. Building with peaked roof in the far background at left is the pumping station. To its right, at river's edge, is the intake station. It is screened by trees. Water is drawn from the river and pumped into basins 4 and 5 (see numbered diagram). Note that water in these basins is the same color as that in the river. By settling of mud and other matter, the river water begins to lose its turbidity. From 4 and 5, the water flows south into 6. More settling takes place. By conduit, the water leaves 6, is treated with alum (in building in foreground, left) and enters 3. Alum causes small particles to gather into larger masses. They precipitate and go to the bottom. As this sedimentation continues, the water flows north into 2 and then into 1. It gets a small treatment of chlorine in 1, then enters a huge filter plant for sterilization. Then it goes into the clear water basin, 7. More chlorine is added. Basins are 35 feet deep. They are cleaned once daily. Hydraulic valves on the bottom are opened to drain out the mud. You are flying over an area northwest of Omaha's Municipal Airport. Runways and buildings are in the background at top. The horseshoe-shaped body of water is Carter Lake. Within the dotted lines is part of the one hundred-acre area that is to be added to the airport. This section extends to the east (left in picture). The heavy black rectangle at left, painted by the artist, is the location of the proposed new northwest-southeast runway. It will be seven thousand feet long, built of concrete. To its right, running parallel, the shorter strip is a present asphalt-surfaced runway. It is 5,400 feet long. It will be used only by light planes after the new runway is completed. 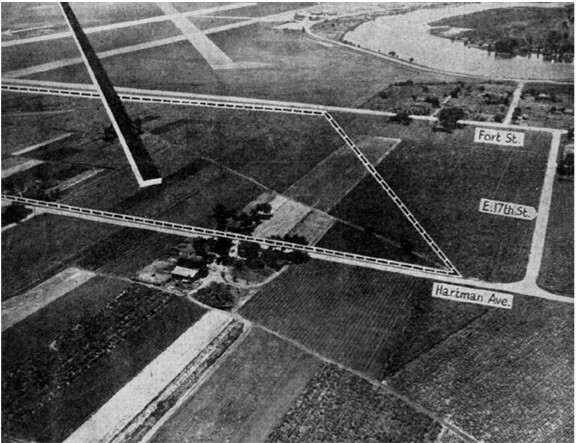 The white strip in background, intersecting the proposed runway, is the present north-south concrete runway. It is 5,153 feet long. It is to be lengthened to six thousand feet. These longer runways are necessary to accommodate big planes. Tuesday, the City Council ordered its Legal Department to draft an ordinance for condemnation of the hundred acres. Addition of this land was recommended by the City Airport Commission and the Omaha Improvement Commission. A thorn that prodded the Omaha groups to act is the fact that United Airlines' one-stop, coast-to-coast flight is stopping in Lincoln instead of Omaha. This is because the runways here are not long enough to accommodate the big ships when they are fully loaded. The magic carpet takes you over Omaha's multi-million-dollar stock yards, second largest in the world. It supplies the nearby packing industry, also the world's second largest. Livestock is shipped here from 22 states. The livestock business in Omaha last year amounted to more than 418 million dollars. This is an average of one and a quarter million dollars for every market day in 1946. This year's volume is even greater. In the center, is the 11-story, million-dollar Livestock Exchange Building. It was built in 1927 and is owned and operated by the Union Stock Yards Company. 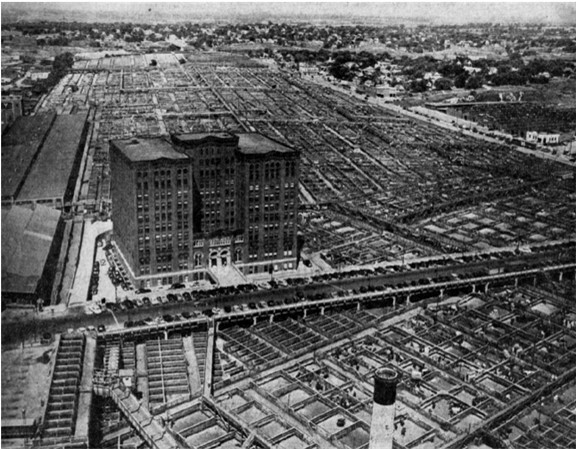 This is a small city in itself, with more than two thousand persons employed in 54 commission firms, plus the offices of order buyers, traders, railroads and packers. It is surrounded by more than a thousand cattle pens in which 35 thousand head of cattle can be processed daily. In front of the building is the special viaduct, which cost a million dollars in 1925. At lower left is a small section of the unloading chutes for cattle. Across the viaduct, the saw-toothed roof covers the hog sheds. Behind it, the flat-topped building is the sheep barn. Approximately 6½ million head of livestock were brought into Omaha last year. Thirteen local packers bought 3½ million of them. Packers in 362 cities in 45 states purchased 1½ million head. About 900 thousand went to stockers and feeders in 31 states. The balance was purchased locally. 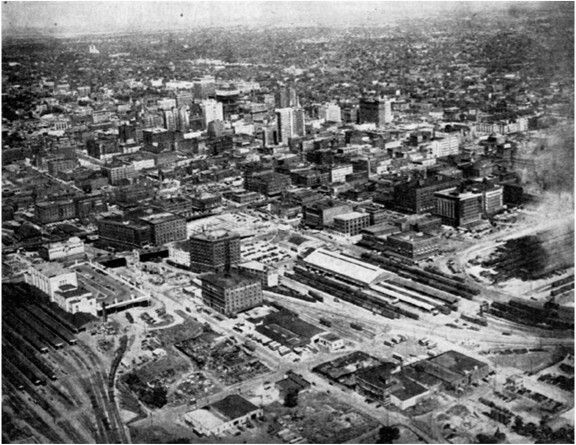 The Union Stock Yards Company, one of Omaha's greatest industries, was begun in 1884. You are flying over the area which may some day be part of an Omaha Civic Center. Pictured are Central High School, centered in four square blocks, and the Joslyn Memorial, occupying two square blocks. The new City Auditorium will be just northeast of the high school. You are looking west. Dodge Street runs the length of the photo at extreme left. Central High School has 80 rooms, including an auditorium and a gymnasium. It housed 1,800 students and 65 teachers during the last school session. Its population was as high as 2,700 during the 20's. 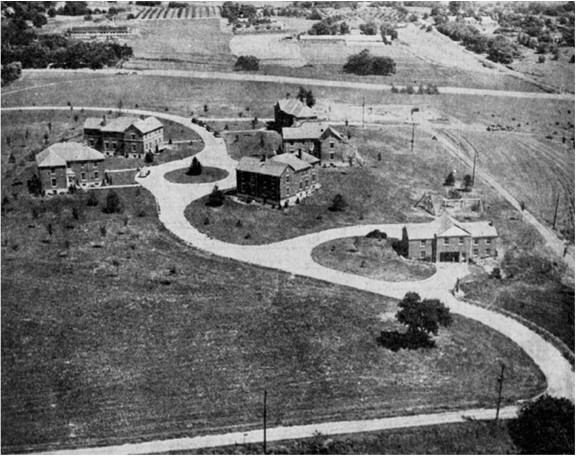 The gym and auditorium are in the large white annex (at right) which was completed in 1932. 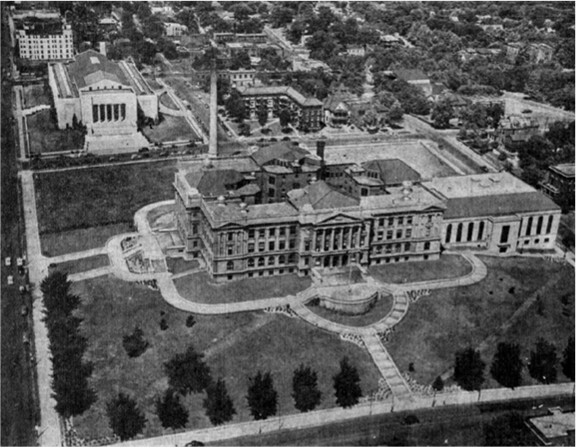 Known as Omaha High School until about 1915, the main structure, built in a square with interior courtyard, was built in three sections. The east section (facing camera) was completed in 1901. The final section on the west was finished in 1912. 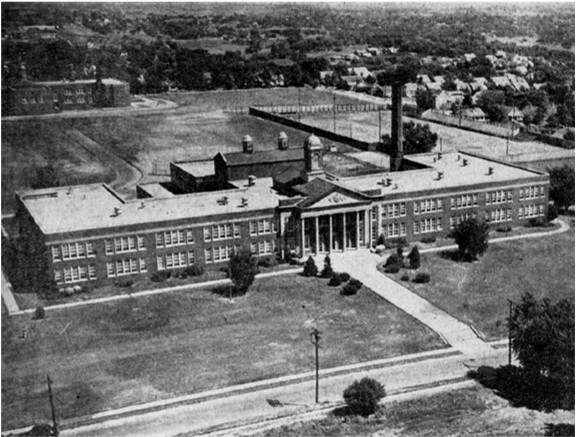 Oldest high school in the city, Omaha High School had its beginning in November, 1859. The Omaha School System was then authorized by the Territorial Legislature. That group then occupied the Capitol Building, which stood where the high school now is - the hilltop at Twentieth and Capitol Avenue. The first high school classes were held in the Capitol Building. In 1872, that building was gradually torn down as a new high school building was erected. It was a four-story, 18-room structure, with a high tower. It cost 225 thousand dollars. It served until 1901. In 88 years, the high school has seen many changes, has produced 15,732 graduates. Joslyn Memorial, one of the city's proudest structures, was a three million-dollar gift from Mrs. Sarah Joslyn. She donated the art center as a memorial to her husband, George A. Joslyn. It was completed in November, 1931. More than three years were required in its construction. Today's view from the magic carpet gives you a look at the main campus of Creighton University. Here is a city-within-a-city. Three thousand students cram its 10 schools and colleges during the school year. The milling crowd contrasts sharply with the handful of youngsters who attended its opening day in 1878. Little more than a cowpath led to the "suburban" college when its doors opened. Building of the first structure was made possible by the generosity of Pioneer Edward Creighton and his wife. Count John A. Creighton later added to the endowment, which was very generous when judged by pioneer standards. The intersection at lower right is Twenty-fourth and California Streets. The dominant stone building on the north side of California Street houses the administrative offices and living quarters for the Jesuit Fathers who operate the University. In this building is the office of the Very Rev. William H. McCabe, S.J., Creighton's eighteenth president and the first alumnus of the school to become its head. Behind the Administration Building and linked with it is the original building. It is now used by liberal arts students and the School of Journalism. The north wing of this building, added later, is used by Creighton Prep students. The long building at far right is the gymnasium. Next to the Administration Building on California Street is St. John's Church. Beyond it can be seen the auditorium roof and three barracks that were moved from Fort Crook to help relieve a classroom shortage. The School of Law is at upper left. 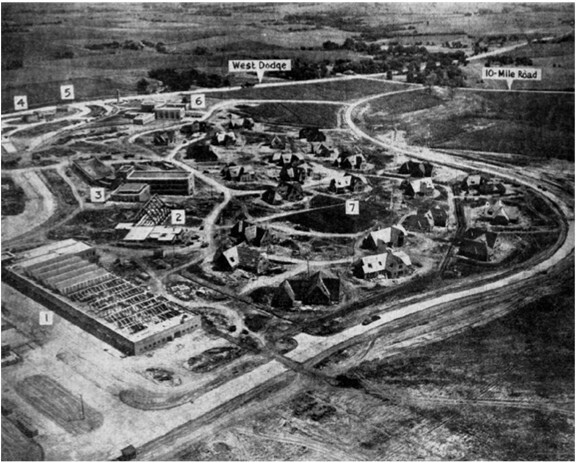 Beyond it but not included in this air view is the School of Dentistry. 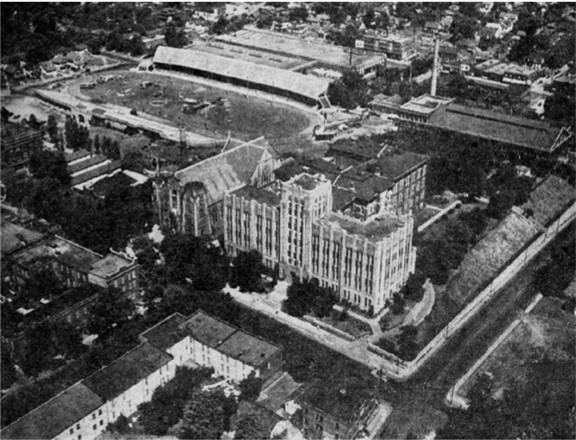 Residence halls are shown at lower left, with St. John's grade and high school at center left, the stadium, no longer used for college football, was cluttered with equipment of the Elks benefit circus when the magic carpet passed over. Creighton's proudest boast is that it is the only privately endowed university between the Mississippi River and the West Coast having a full complement of professional schools. Schools and colleges in addition to those shown are: the School of Pharmacy and the Schools of Nursing. Through the years Creighton has instructed 25,814 students. During World War II three thousand Hilltop men served in the armed forces; 150 of them are represented on its Gold Star flag. To help relieve congestion, alumni have subscribed $731,806 in the past year to a building fund and endowments. Slightly more than one-tenth of the alumni have been contacted. Included in the tentative plans are buildings for the School of Medicine, Commerce, Creighton Prep, the Science departments and dormitories. You are looking down on Benson High School, which faces Maple Street (foreground) between Fifty-second and Fiftieth Streets. Its colonial-type entrance, symmetrical wings and vast expanse of lawn make it one of the best looking buildings in the city. Built to accommodate eight hundred pupils, it now has an enrollment of more than 1,400, and 51 teachers. There are 34 rooms, plus a library, cafeteria and two gymnasiums. One of these was created from a roughed-in swimming pool, never finished. This building was first occupied on December 17, 1926. Pupils at the former high school, now Benson West grade school, marched in a body to take possession. In background at right is the fenced-in stadium, which is equipped with lights for night games. Other open areas are practice fields. At left is the running track and field for track athletes. In center is a baseball field. In upper left is Monroe grade school, built in 1926. It is one of Omaha's most recently constructed school buildings. The magic carpet is about two thousand feet high, and you are flying northeast over the new 90-acre tract at Boys Town. This is the three million-dollar High School Development, begun in 1946. This immense project is directly east of the present Boys Town. To be used exclusively for boys of high school age, this development is a town by itself, and will be larger than some villages in Nebraska. From the air, it has the appearance of a pretty toy town at Christmas time. New concrete roads and drives form entrances from Dodge Street and from Ten Mile Road. At (1) is the Trade School Building, which will house 11 trades. Office and entrance is at left. This is a one-story structure, 100 by 400 feet, with saw-tooth roof. A large dining hall (2) with dome-shaped roof will seat five hundred boys at one meal. The three buildings somewhat like a Y at (3) are the high school. The unit nearest you is the library. The left wing will have classrooms. The largest unit is three stories. It will have classrooms and a large auditorium on the top floor. A reception center for visitors is at (4). It has long slender windows, is modernistic in construction. The Boys Town Courtesy Patrol and a bus depot are at (5). The near-by perpendicular shaft is a tall pylon which faces Dodge Street. It bears the name of the institution. A large building in several units at (6) is the Administration and Welfare office. This is the business office for Father Flanagan and his staff. It will also house the print shop. The general housing area is shown at (7). There are 25 cottages in this section. All are two-story brick construction. Each will have 20 boys and one councillor. The High School Development will have a population of five hundred youths. There are also five hundred boys under high school age in the present Boys Town. They are housed in dormitories and have their own dining hall. The new unit is expected to be occupied shortly after the first of the year. The magic carpet takes you over the Omaha Masonic Home for Boys. It is centered in a vast expanse of green lawn studded with shrubbery. It is located near Fifty-second Street and Ames Avenue. 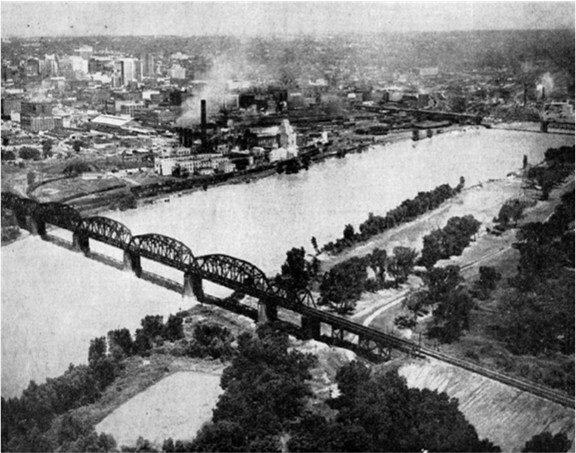 The camera is looking north, and Ames is shown in the background running across the width of photo. Deep in foreground is Sprague Street. From the air, the driveways present a unique double O pattern. About 85 boys live in the five buildings, which are named for their respective sponsors. Beginning at left and proceeding clockwise they are: Carl A. Anderson, Henry B. Neef, Tangier Shrine, Earl K. Buck and A.C. Scott. The building at extreme right (near playground) is a garage. The new home was formally dedicated in September, 1945. Previously it had been located in a three-story frame building on South Thirty-third Street. The home is not maintained by the Masonic Grand Lodge, but by voluntary contributions of Masons and their friends. It is exclusively for boys of non-Masonic families. Future plans include a superintendent's dwelling to be built near the Anderson building. An administration building and several additional boys' homes will be built on either side of the driveway at top and left in photo. Beyond Ames Avenue (in upper left part of picture) is the Jewish Home for the Aged, now nearing completion. Ground-breaking ceremonies for this home, to cost 225 thousand dollars, were held a year ago.